Mobile device management company MobileIron has launched an app that is designed to enable IT to oversee enterprise devices from iPads and Android tablets. Additionally, MobileIron has unveiled a setting that will allow IT managers to define parameters for workers in order to ensure privacy and security. 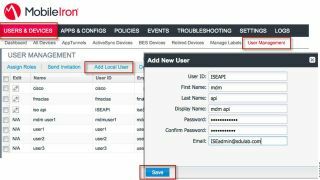 With the new tablet app, MobileIron Insight, MobileIron would like to give IT administrators the flexibility to control mobility deployments regardless of their own location or tablet device. From within the app, users can access data on which workers are using which device, which carrier they are on, and whether or not their activity is compliant with pre-established restrictions. The tool doubles down on bring-your-own-device (BYOD) policies by allowing the policymakers themselves the ability to choose the device on which they perform their tasks. As a new part of MobileIron Core, the company’s flagship platform, the MobileIron Spaces setting will allow IT to establish data and task boundaries to protect user privacy, the company said in a statement. The new setting guarantees that administrators can only access mobile data and take actions based on pre-determined parameters. This is built to ensure unauthorized administrators don’t view data that they are restricted from accessing. Parameters can be set based on business unit, region, device, and role. Which mobile device management companies should you be familiar with?